In order to start the tutorial with the same level of knowledge, first, we should explore WordPress basics and find out what is what in this CMS. What’s the difference between Post, Page, and Category? What is a plugin? Where and how could you change the Appearance? Only after we clear that out, we could continue to the tutorial on how to create and maintain a website with WordPress. Let’s start! In short, a CMS is short for Content Managment System. This is a system that makes the management of a website or other online content as easy, as possible. CMS or Content Management System is kind of software or a set of related programs that are built so, that the users could manage and create digital content. The biggest asset that the users get from such a system is the fact that they are fairly user-friendly. Those systems are designed to allow users with little to no knowledge in programming to create websites. WordPress is such a CMS. In short, WordPress is arguably the most used CMS in the world. As we already said WordPress is a CMS. Like everything on the Earth, WordPress is also not perfect, but boy is it close! It has pretty much everything you could need in order to create a website. The things that this CMS doesn’t offer, you could easily find among the plugins, the premium themes or you could even create it yourself because WordPress is an Open Source project. Simply put, WordPress theme is the general layout of your website. Most of these themes are highly customizable for the common user. On the other hand, for some of them in order to customize, you’ll need at least basic knowledge in some coding languages, especially HTML and CSS. Essentially the themes in WordPress are kind of template for your site’s general view. A lot of them are multi-purpose but often this is not the case. Some of the themes are made only for blogs, others to be a business card, with some of them you can create a one-page website, with others – a magazine. And there are, of course, those which are meant to be a shop. What else could you need? What is a WordPress Post? In a few words, posts in WordPress are updatable peace of content. Usually, they go from the newest to the oldest, thus becoming irreplaceable for a blog, a magazine or news-oriented websites. Posts are extremely valuable in a number of ways. They will automatically show in the order you published them. Thus, they are irreplaceable if you are creating a blog, a web magazine, or news-oriented website. Furthermore, by using certain plugins you could change their entire appearance. How about that? You can categorize, tag and even archive the posts on your site. If you have RSS feed, the content that the subscribers will receive is the one in your posts. The posts are essentially the news portion of the site and a must-know in the WordPress basics. The categories are like the folders on your computer. We use them in order to organize the posts in different categories so that the users will get a better UX(user experience) when they are searching for a specific topic on your website. Although Pages are very similar to the posts and one could be easily fooled to think they are the same – they are not. But in order to fully understand the posts, we should examine some parts of the content organizations. We decided to start with the categories because when speaking of organizing content in WordPress, the categories are at the top of the hierarchy. Bear in mind that categories could also have a hierarchy. That means you can nest one category under another by making one of the Parent of the other. To be more vivid we’ll explain that with an example. Say, you have an online magazine, where you write about Health & Fitness. As you know, the different articles(which you could refer to as posts) should be organized in separated categories. In the imaginary magazine that we’ve just built with you, we’ll have two main categories – Men’s Health and Women’s Health. Under them in the so-called sub-categories, we could have Fitness for men, Dieting for men, Men’s Lifestyle, etc. (for men) and the same go for women. Of course, you could have a hierarchy with fewer or more levels. It depends only on your needs. WordPress is very, very flexible. In the menu bar (which we will also address in the WordPress Basics – Part 2) you could make a category to seem like a Parent of page or the other way around. This option has its application, of course. But here we are making a brief overview. But how will you separate the different posts if you decide to go with fewer categories? The tags we use in order to further specify the category of the post. Think of them as some kind of sub-folder. On the other hand, bear in mind that there are sub-categories. So, the tags are a really specific organizational method. The tags are kind of keywords that help you to organize the content on your site even more. They are really valuable, not only for content organizing. Search Engines can read them and also the users could search them on the site. Let’s use the example with the Health & Fitness magazine in order to understand tags a little better. Say you created an article about a chest exercise. The article fits better in the category Men’s Health, so this is where you’ve put it. Now, let’s say, for the sake of the example, that you’ve decided to have a hierarchy with fewer levels. So, we have just Fitness and then Exercises. For your users to be able to find and orientate into your content it could have only the categories, but since we have so much and different types of exercises and not a single category for them, we could use tags.So in tags, you could put ”chest exercises” along with others. Now every time a user clicks on the tag “Chest exercises” they’ll get to a page that shows all the articles that have this tag. So in tags, you could put ”chest exercises” along with others. Now every time a user clicks on the tag “Chest exercises” they’ll get to a page that shows all the articles that have this tag. Bear in mind that if you put the tag “chest exercises” under a number of articles in both of the main categories (Men’s Health and Women’s Health) when a user clicks on the tag he will see all the articles that fulfill such a request. Essentially that means the articles won’t be divided by their main category, but by the tags. What is a WordPress Page? Pages are very similar to posts, but the difference is that the pages are meant for a static and/or stand alone pages. Such pages are the About, Contact and your Main pages. The pages are very similar to posts. At the same time, they are much different from them. ‘What is the difference between WordPress post and a WordPress page’, you may ask. In a word, pages are built to be static. They are not meant to be related to one another, although they could be. Their relations are much like the relationship between different categories. They could be or have a Parent. The best example and most common usage of Page are the “Contact us” or the “About page”. Of course, you could have a Home page, but that’s something we’ll address in the next article. For now, remember that pages are static and don’t go to the RSS feed. They have the purpose of showing a standalone kind of information that is not planned to be updated anytime soon, or at least not so often. The location of your business, the mission and the vision that you have or even the team bios. Those are some of the things you’ll want to put in a Page instead of a Post. 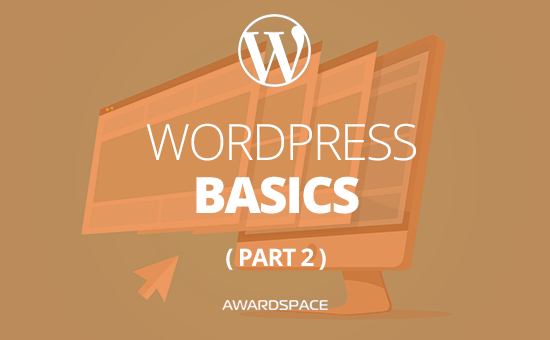 Check out WordPress Basics – Part 2!